Excellent location by land and water! Beautiful lakefront home with a view for miles. 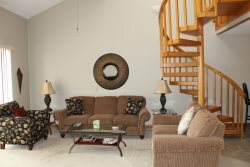 Situated in a large open cove, excellent location by land and by water. Main level offers a walk out to a deck. Beautiful downstairs has a full length screened in porch. This home offers two decks and is located in a great cove and includes a dock for swimming (boat slip not available). Did we mention only two steps entering the front door from parking? Pets may be welcome with an additional $50 non-refundable per pet fee.